Eight Oregon birders met in San Francisco to board the Coral Princess for its repositioning cruise to Vancouver, British Columbia. The ship departed in the afternoon of May 19th, and by dawn on the 20th was off Del Norte, County, California--that state's most northern county. We birders would spend the entire day traversing the entire Oregon coast, getting too dark to see birds just before crossing into Washington State waters. Because of the shape of the Oregon coastline, the ship was about 35 miles off the southern Oregon coast, and 60 miles off the northern Oregon coast. Cruise ships are the only reasonable way for birders to get to waters beyond 35 miles of shore--off the continental shelf. Pelagic birding trips using chartered fishing vessels barely reach 30 miles offshore and can only spend an hour or two before heading back to port. Thus, if you want to see deep water specialties (rarities), a cruise is the way to go. 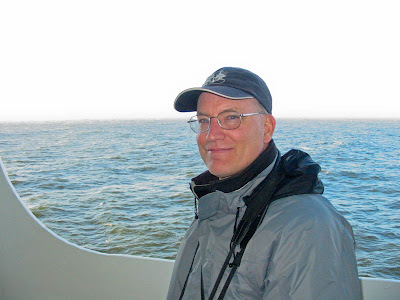 Cruise birding is different from any other kind of birding you may do. It can be highly enjoyable and addicting, but disappointing if you do not know what to expect. We started under sunny skies, with a bit of wind. Even with a later-than-scheduled departure, we were seeing albatrosses out the window by dinner time. We awoke at dawn, had some breakfast, and made our way out on the Promenade Deck--Deck 7--which goes all the way around the ship. This particular ship did not have a covered deck on the bow as some ships do. This is an important feature for larger birding groups. There also were fewer overall birds than on previous spring cruises, perhaps due to this later than usual cruise date. Oh, there were still birds aplenty, but many were quite distant. This proved to be a bit of detriment for me, as I will explain. 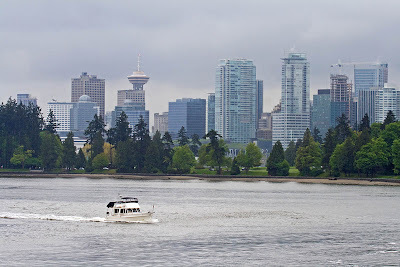 Cruise birding is far different than taking a pelagic birding trip on a chartered fishing boat. Of course, the ship is larger and you can use a scope on the calm decks. Food is included on your cruise price, with many dining rooms. But then, birders mostly want to stay on deck looking at birds during daylight hours, so knowing where the grill and pizza bar are located is important. And you can get a good night's sleep in your stateroom each night, rather than driving to the pelagic trip's port of departure in the predawn hours, as do many birders. 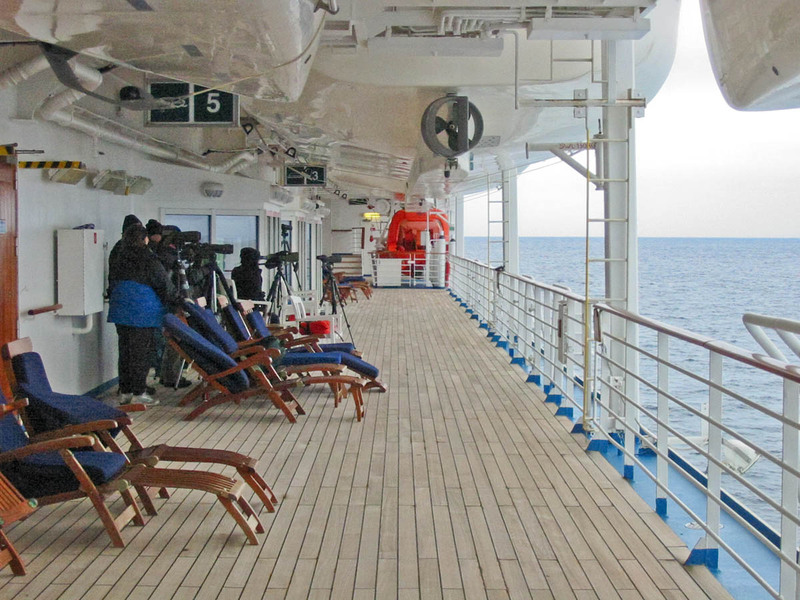 But the main difference between cruise ship birding and pelagic birding trips is how far you are from the birds. The pelagic trip is designed to go where the birds are and even chum them right up to the boat. Frankly, large ships scare birds. And watching from Deck 7, perhaps 40 feet above the water line, gives you about the same experience as a seawatch--watching birds from a coastal headland. Cruise ship birding is done primarily with a spotting scope. Few birds are within 1/4 mile, or about the length of the ship. 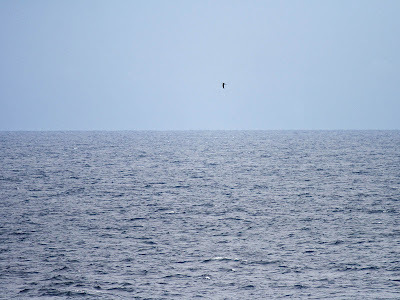 Many birds are spotted flying from the boat about 1/2 mile distant and are soon more than 2 miles distant. A scope, then, is essential. And some experience and study is needed to know what birds you are seeing--shape and flight style are essential, as lighting is often poor for picking up plumage colors and patterns. The Pacific Loons above (one in breeding plumage and one not) were very close (for a cruise ship)--within 1/4 mile of the boat during our way out the San Francisco harbor. 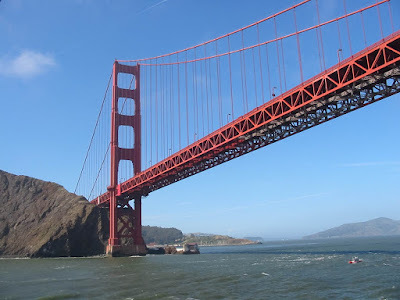 This was of particular trouble for me, as I awoke on the 20th with a screaming headache--perhaps from dehydration during the previous busy travel day. For the first couple of hours it was difficult to even have my eyes open at all. Later, the headache went away, but I decided I would only use binoculars to bird--I didn't want that nauseating headache to return. Staring through my scope with one eye for an entire day, as water streamed constantly by, was a sure way to bring that headache back! Using "binoculars only" meant that I was unable to identify shearwater-sized birds beyond about a mile and a quarter. I saw far fewer storm-petrels than the other birders (53 compared to 298). I identified no Cassin's Auklets, with about 19 seen by others throughout the day. Those birders using scopes could spot the storm-petrels and Cassin's Auklets out there a mile, and shearwaters out 3 or more miles. 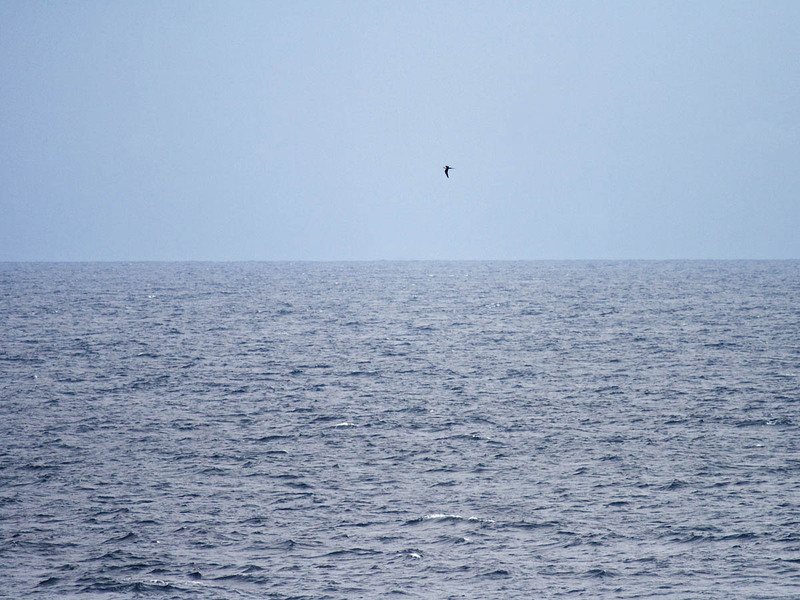 There were numerous Long-tailed Jaegers seen, such as the bird above. This one was about 1/2 mile distant--about as close as they got to the ship. But my headache didn't mean that I didn't see good birds--because I did! While still in California waters, 2 Laysan Albatrosses flew by. 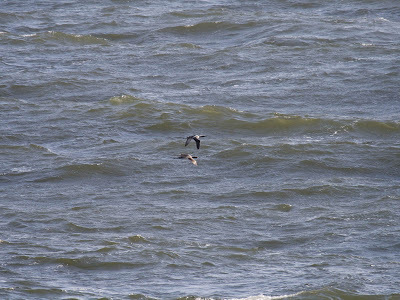 Then Russ and I identified a Pterodroma by flight style, and a bit later my life Murphy's Petrel swooped up with the same flight style right alongside the boat! I observed 4 more in Oregon waters. Only Owen Schmidt and Jeff Gilligan independently identified a single Ashy Storm-Petrel in Oregon waters. The light was bad, so they primarily had only flight style and shape to go by, but they did note the all-dark rump. There are about a half dozen sightings of this species in Oregon waters--unfortunately none seen well enough to pass a records committee yet. I think, for storm-petrels in general, a video showing it flying would be more helpful to a bird records committee to accept it than any but a very close series of photos. Another rarity, a pair of Parakeet Auklets, were identified by Tim Shelmerdine, Russ Namitz, and David Smith. I got a glimpse in a borrowed scope, but couldn't make out any diagnostic field marks before they splashed back down in the water. We also saw Northern Fur Seals, Northern Elephant Seal (Russ only), Dall's Porpoises, Humpback Whales, Sei Whale, Pilot Whales, Orcas. So, the trip had a long-desired life bird (Murphy's Petrel), a missed lifer (Parakeet Auklet), and a missed state bird (Ashy Storm-Petrel). These were my three target birds for this trip. Well, I'll get those others another time. Related previous posts you may find interesting if you are planning such a cruise. 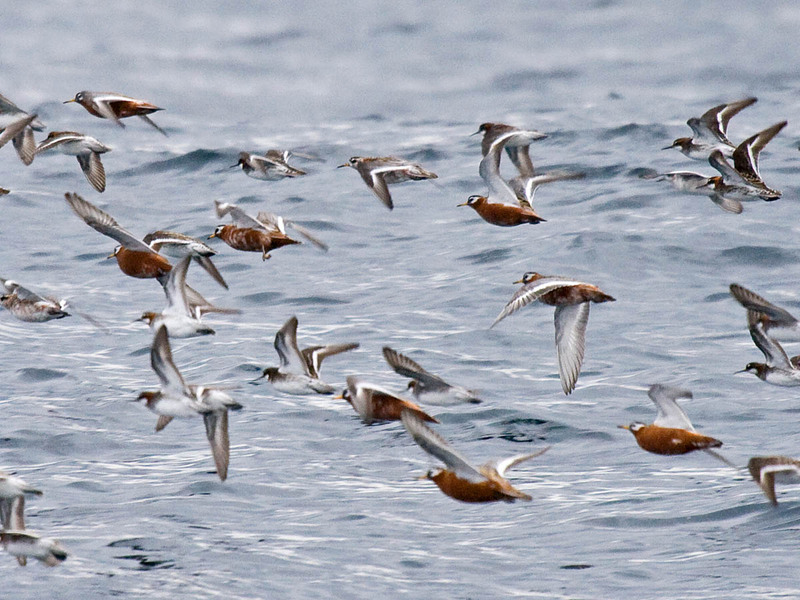 Rarely do birders see Red Phalaropes in breeding plumage on the West Coast. The one notable exception is on May pelagic trips. 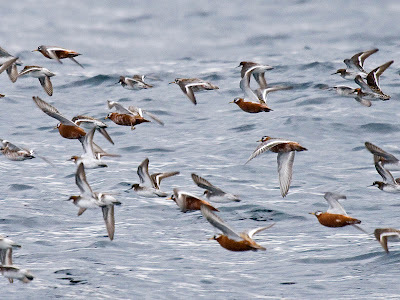 In the photo above are both Red and Red-necked Phalaropes at sea off Newport, Oregon. This was our new "Seabirds of Oregon" trip, an 8-hour trip from Newport. The first part of the trip heads over to the scenic Yaquina (ya-KWIN-a) Head lighthouse and seabird colony. This accounted for the majority of Brandt's Cormorants and Common Murres counted. 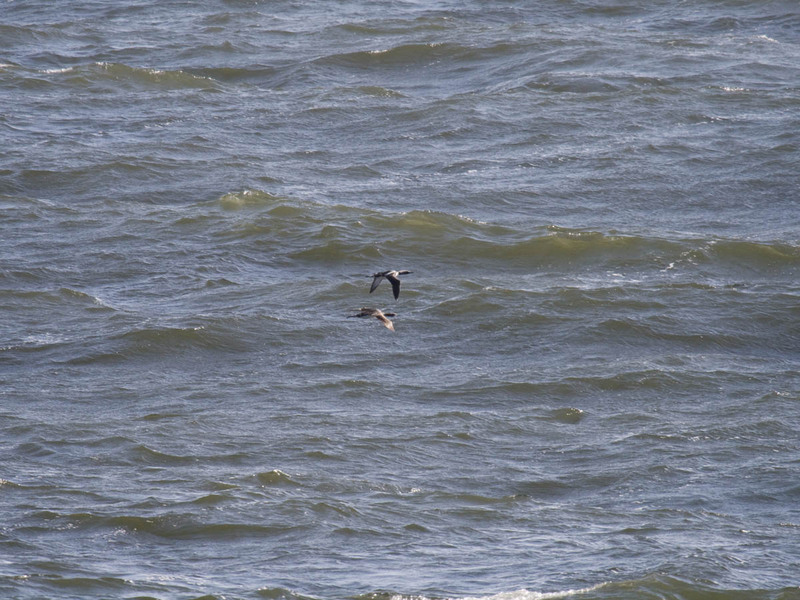 Then we headed offshore, stopping when we encountered numerous seabirds about 22 miles offshore. We traveled on the boat "Misty" with Captain Rob Waddell at the helm.